The Kelly Law Team (KLT) is delighted to announce that for the fourth year since 2016, it is offering an educational scholarship. This year, as in 2015 and 2017, the scholarship will be open to those with Autism Spectrum Disorder (ASD) who wish to continue their education. The award will be applied to offset tuition at the educational institution chosen by the applicant. 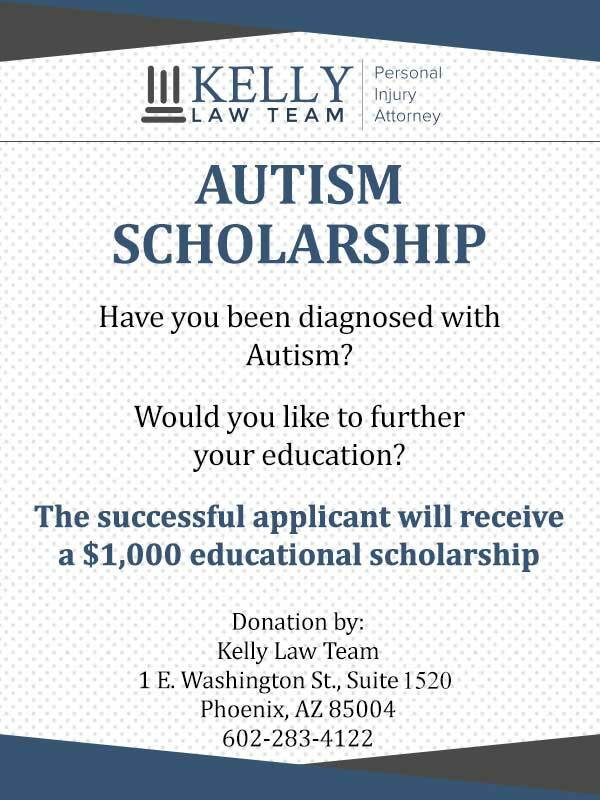 Our firm believes that because ASD may have a profound impact on a person’s education, tuition assistance can have a positive influence on an individual’s desire and ability to pursue their educational goals. Eligibility for the scholarship is open to United States citizens diagnosed with ASD who would like to continue their education at the trade school, junior college, college or university level. We do not require that you be enrolled in school at the time you submit your application for the scholarship. The deadline for submitting your application is February 5, 2020. The submission consists of (a) the application (below), (b) a statement of not more than 100 words discussing how you intend to use the scholarship to assist in obtaining your career goals, and (c) an essay, which is optional, of not more than 1,000 words discussing how your educational has been impacted by autism. We may ask you for evidence of your ASD diagnosis. We will announce the name of the winner on or before June 17, 2020. The selection will be at the discretion of KLT. The tuition will be paid directly to the school chosen by the winner. 3+3 Answer to prove you are human. Thanks! When your application is submitted, it becomes the property of KLT. Your information will not be sold to any person or company. We may, however, use your information in connection with the publicizing or reporting of our scholarship program.